The beginning of autumn already, eh? Luckily the sun is gracing us with its presence here, keeping my mood buoyant after the battering it’s received recently. Over the last few days I have found myself further amazed by the rudeness and unprofessionality of some people, who shall remain nameless. I will say no more than that, but let me instead take this opportunity to tell you all about some forthcoming events that will be both fabulous and enjoyable. I must warn my fellow ‘vintage snobs’ that these events may or may not contain people in fancy dress, but I shall be there anyway, supporting sincere and passionate friends who are either organising or attending the event as part of birthday celebrations. And who won’t send me insulting emails if I dare to have any criticisms. First up, it’s the return of The 39 Steps, who are hosting another amazing vintage tea party to celebrate their 4th Birthday at the Criterion Theatre on September 9th. vintage-clad guests will see this rib-tickling comedy, then be treated to a decadent tea party in the stunning art nouveau Greene Bar inside the Criterion Theatre. It will be decorated especially for the occasion with Vintage Secret wares, and fabulous vintage cakes will be supplied by The Vintage Patisserie (as seen on ‘Dragons’ Den’), washed down with tea-based cocktails made with Marquis Vodka, served from vintage tea pots. I guarantee you’ll enjoy the play, and if you’re a fellow vintage fan who hasn’t seen it yet, this is your chance to get a fabulous seat at an amazing price. Dress to the nines! The next event I’ll be trying out is the ‘maiden voyage’ of the SS Atlantica on the 11th September. I say ‘maiden voyage’ in inverted commas because actually there was a launch night this time last year, but it wasn’t on a real boat then… this time it is! Here’s the blurb, which puts it better than I can. 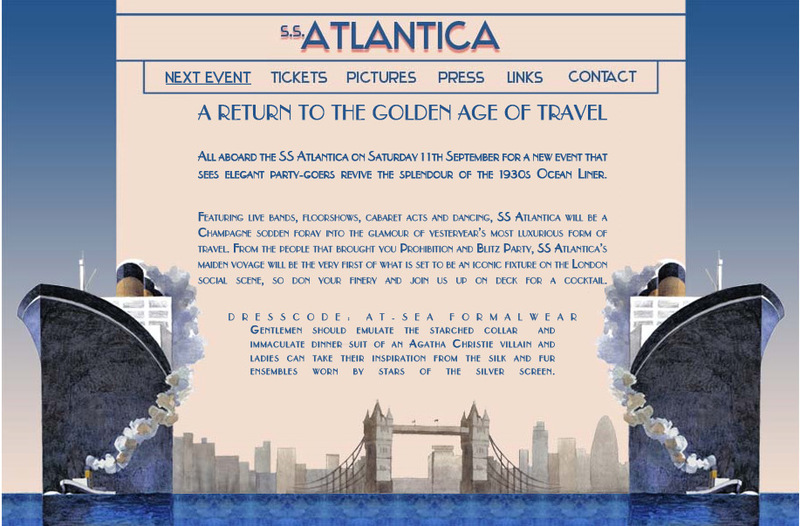 Revive the timeless elegance of the classic ocean liner at the SS: Atlantica, setting sail on Saturday 11th September 2010. Recreate the luxurious sea travel of yesteryear andl dance the night away immersed in decadent glamour and fine entertainment. For one night only, the beautifully art deco Silver Sturgeon, a luxury clipper, will be transformed into a luxury cruise liner circa 1931. Curving balustrades and portholes encircle …a dance floor, lined by roulette tables and two bars serving classic cocktails and Champagne and a stage holding live floor shows and bands. From the people who brought you Blitz Party and Prohibition, entertainment will be provided by London’s finest live bands, singers, dancers and cabaret acts, all performing in the style of the era. The dress code is ‘At-Sea Formalwear’. Gentlemen should emulate the starched collar and immaculate dinner suit of an Agatha Christie villain and ladies can take their inspiration from the silk and fur ensembles worn by stars of the silver screen. Guests embark at 8pm, with the boat leaving for an hour long cruise up the Thames at 9pm. Sounds rather splendid, doesn’t it? This is the birthday bash I mentioned. Better steady those sea legs! 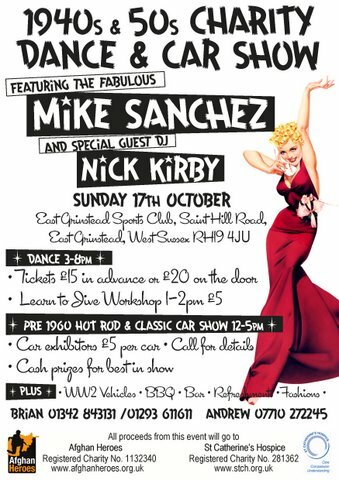 Next on the menu for me is a charity dance on Sunday the 17th October, for a very worthy cause. Click the picture to see all details full size. This event will be chock-full of good music, wonderful dancers and classic cars, and there will be some really good repro for sale as well. Can’t wait! Finally, if you’re into dressing up, good music and likeminded people, then save the date for a very special Halloween Party hosted by yours truly and Emerald Fontaine! Following the huge success of our last Halloween party at the Fox, we’re returning for a one-off date and a very surreal party. We’re still firming up the details of the band and the vintage DJ(s) and making a new website, but the date is Saturday the 30th October, the venue is the Fox in Shoreditch, and the night will be called, ‘Don’t Dali with the Devil’. Named after a 1939 song, the theme will be anything and everything strange and old-fashioned. Come dressed in WWI uniforms, Dada-insired costumes, Cabaret Voltaire, steampunks and Victorian mad scientists, 1920s-1950s vintage of any kind… red roses, moustaches, not-pipes and lobster telephones expecially welcome. More on this soon, but keep the date free! Wednesday 1st September 8pm–11pm Upstairs, The Wheatsheaf, 25 Rathbone Place, London W1T 1JB Members: Free Non-Members: £2 (first visit free) Guest Mr Martyn Downer will spill the beans on The Sultan of Zanzibar, the story of Horace De Vere Cole, a long-term practical joker. His greatest coup was in the early 20th century when he and his friends dressed in African costume and claimed to be the Abyssinian royal family. In full costume they wangled a tour of Royal Navy battleship HMS Dreadnought. Mr Downer has recently published a book on De Vere and his exploits. Oh I was planning on going to The 39 Steps just for the dressing up, I didn't realise there would be a tea party too! Or that Naomi was an organiser. Really need to get off my arse and book tickets, after I have cajoled some others into coming with me. The cruise sounds amazing, as does the Halloween bash (which sadly I'll be away during, or I would most certainly come along). Oh, how I wish I could go on the SS Atlantica! I would absolutely love to! EEKS> I am ready to swim across the pond if needed to get to that 1931 cruise event! Waaaahhhhhh! There's nothing fun happening where I am! I want to go to London now, now, NOW! Ooh, lovely! I was thinking, "maiden voyage?!". Glad you explained that one, I was starting to think that I hallucinated last year! I love the idea of the 39 steps thing but can't go sadly, the Halloween do sounds fab, and it's my birthday but I had a sneaking suspicion someone mentioned something already for that night which is sad cos it sounds like I would have a fab birthday night there! Oh I'd love to go to on the SS Antlantica, it sounds so wonderful but alas I cannot afford it. Maybe next year. But I hope to come to your Halloween party! Oooh the "Atlantic" event sounds amazing, wish I could be there!! The 39 steps sounds amazing. On another point, don't let the emails get you down. I love your site and I am really inspired by your views. The S.S. Atlantica event sounds like so much fun! Well, all the events sound fantastic, but I like the idea of that one the best. Anything that harks back to the golden age of travel has to be a very good thing indeed. I am so surprised at people who would criticise you for an opinion that you have about an event! I think that being a fellow blogger gives me the responsibility to be encouraging and positive! I hope you aren't discouraged and will keep up your lovely blogging! I wish I could go on the SS Atlantica!!!! It is a shame that in Brazil we don´t have events like that!! Ss. Atlantica sounds fabulous! I would have the perfect dress for the occasion (white beaded evening dress with train) and all but unfortunately I'm not able to get to England for the evening since we also have other plans with my hubby for the same evening 😀 Anyhow, if that event becomes annual we might be able to attend next year. Have a fantastic time at all those marvellous events ,luv to Inigo i hope he is fully recovered now & in raging good health! We excitedly booked tickets for the SS Atlantica but sadly found it rather a let down… We were expecting to board ship at 9pm but were left standing by the roadside in the cold for ages as the boat didn't arrive until 9.50pm! Apart from the roulette tables, the entertainment consisted of one dj and one cabaret act. Both were great, but hardly fitted the promise of "London’s finest live bands, singers, dancers and cabaret acts" ! The boat had 2 lovely spacious rooms inside and a great open air bar on deck, but frustratingly there was only music in one room and the other areas were completely silent! All the guests were so beautifully dressed that the whole crowd looked like they'd stepped straight off the silver screen with jaw dropping effect, but sadly it felt like the organisers had made the absolute minimum of effort and it was pretty much an evening geared towards selling expensive cocktails. I'd love to know if any other guests felt as let down as we did?